6/1670 Lance Corporal John Cecil Abraham Sewell, 1/6th Battalion, Durham Light Infantry  died 1 December 1918  and is buried in Evenwood Cemetery. He was 27 years old and is commemorated on the Cockfield War Memorial. In 1901 the family lived at Burnt Houses, Cockfield where Jonathan worked as a colliery winding engineman. 18 year old Francis Heaviside was a school teacher. By 1911, the family lived at 10 Bleak Terrace and Jonathan was described as a “stationary engineman”. 21 year old Norman worked as a “colliery stoker”, 19 year old J. Cecil A. was a labourer above ground and 17 year old Victor was a driver. At this time, 15 year old William Heaviside and 14 year old Bertha lived with them, being nephew and niece. In 1917, J. Cecil A. Sewell married Jane Featherstone  and they has a son George. J.C.A. 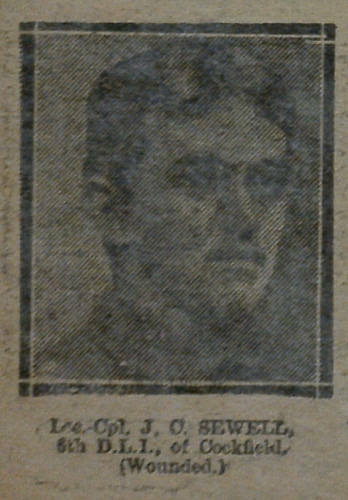 Sewell died 1 December 1918. At this time, they lived at 3 West View, Evenwood. His death certificate confirms that he died from influenza and pneumonia. There were 13 burials at Evenwood during December 1918. The service record of Lance Corporal J.C.A. Sewell has not been researched. 15 April 1912, he enlisted into the Durham Light Infantry (DLI) and was allocated the regimental number 6/1670. 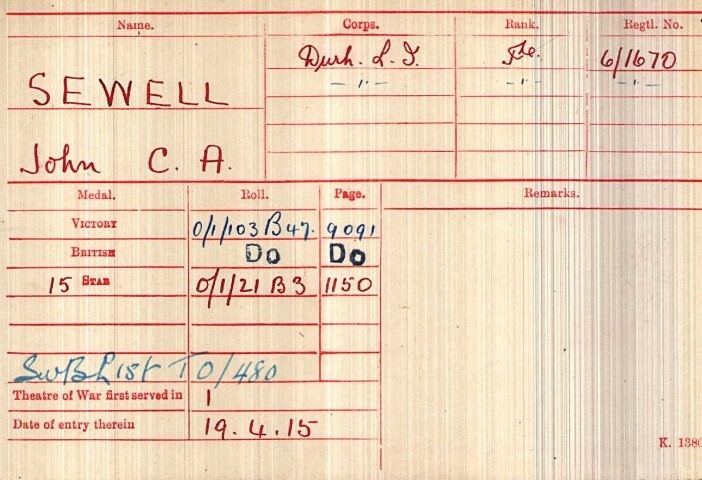 Private J.C.A Sewell entered France 19 April 1915  with the battalion. As Lance Corporal J.C.A. Sewell he was discharged 29 August 1916, the cause of which was “illness” under paragraph 392 (XVI) Kings Regulations. Between April 1915 and late August 1916, the Division served on the Western Front and took part in the Second Battle of Ypres, 24 April – 25 May 1915. The battle is most infamous for the first use of chlorine gas on the Western Front by the Germans, 22 April at about 5pm. The worst concentration of gas fell upon the 45th Algerian Division and the 87th French Territorial Division and also the left flank of the Canadian Division. Casualties were heavy and a gap of several miles was torn into the French lines through which German troops poured. French and British units were rushed to the area to stop the advance. The situation was extremely serious for the Allies. The Northumbrian Division was called forward only days after arriving in France, the DLI Brigade was attached to the 85th Brigade. 23 April: 6/DLI concentrated at the village of Hardifort, marched to Steenvoorde. By evening 6/DLI and 8/DLI boarded a fleet of London double-decker buses which set of for Vlamertinghe, reaching the destination by late evening. 24 April: Vlamertinghe, standing-to. 6pm received orders and marched to Ypres, passed by the damaged Cloth Hall and through the Menin Gate and along the road to Zonnebeke, the ruined village of Potijze and beyond to relieve 2/Shropshire Light Infantry at about midnight. The line ran northwards from Zillebeke Lake to ½ mile east of Wieltje where it gradually turned north-west to Boesinghe. 25 April: remained here under shell-fire having 3 men slightly wounded until 9pm. Marched along the Zonnebeke road and stopped outside Verlorenhoek and spent the night in hastily dug trenches. 26 April: ordered to advance to a line from a level crossing to Hill 37 and drive back the Germans who had broken through. The instructions were considered to be “vague in the extreme.” As soon as the battalion showed itself it was subject to heavy shell-fire and accurate machine-gun fire. Losses were 8 officers and 140 men. At 6pm the Battalion was ordered to support 7/DLI and a battalion of the Shropshire Light Infantry who were to attack a hill held by the enemy. For “B” Company who went forward and filled a gap alongside the 1/Hampshire Regiment it was the beginning of a 5 day ordeal in the front line trenches. They were relieved 30 April. “B” Company suffered 14 NCOs and men killed and 55 men wounded. “C” Company remained in support and took up rations at night to the other 3 companies. “A” and “D” Companies spent the night under hedgerows. No attack materialised. 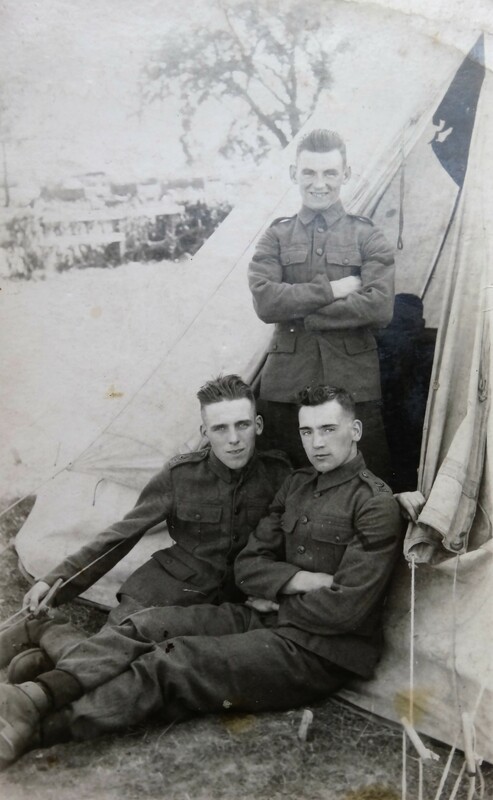 27 April: “A” Company joined the front line by filling a gap between the Hampshires and Northumberland Fusiliers where they remained for 4 nights under heavy daylight bombardment. 28 April: the wounded were brought back by a ration party. 29 April: the battalion less 2 companies who were in the front line marched back Verlorenhoek arriving at 8pm. and dug in. 30 April: “A” and “B” Companies relieved at night and re-joined their battalion 1 May. 2 May: at 4.30pm the Germans commenced another violent bombardment of the front line and released gas again. 6/DLI ordered to stand-to and remained so until 7pm. The front line had held. 10.30pm 6/DLI marched off through Ypres to huts at Vlamertinghe for rest. In the 5 days fighting, casualties were 3 officers killed, 12 wounded, 2 sent home suffering from shock; 27 NCOs and men killed, 218 wounded and 34 missing. Later research records that between 25 April and 2 May, 6/DLI lost 3 officers and 50 other ranks killed in action or died of wounds, 2 officers and 42 other ranks on 26 April 1915. The situation at Ypres continued to be serious and the British were in an unenviable position and had to shorten their front line to remove the danger of outflanking attacks. A decision was made to withdraw to a new defensive line, near Hill 60 – Sanctuary Wood-in front of Hooge-Frezenberg-Mouse Trap Farm-Turco Farm where it joined the old line. The move was completed on the night of 3 May. This was the baptism of fire that territorials like Private (later Lance Corporal) Sewell entered. The battalion remained at Ypres until June 1915, moving to a quieter sector Kemmel and Armentieres until it returned to the Salient December 1915 and Sanctuary Wood, the Bluff and Hill 60, names which are etched in history of the Great War. The date when Lance Corporal Sewell was hospitalised is unknown therefore it remains unknown whether he served at such locations. He was discharged 29 August, “sick.” His illness is unknown. Lance Corporal J.C.A. 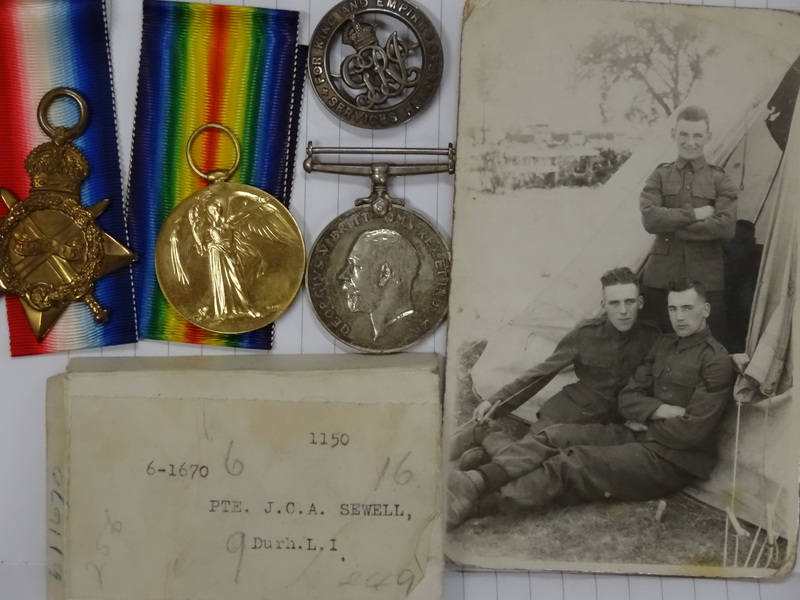 Sewell was awarded the Silver War Badge, the 1914-15 Star, the British War and Victory medals. 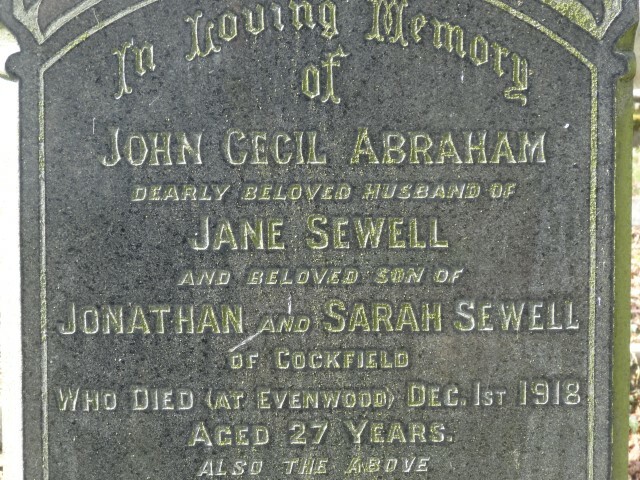 4 December 1918: J. Cecil A. Sewell was buried at Evenwood Cemetery. A family headstone marks his grave. J.C.A. Sewell’s badge number is 154923. The British Empire lost more than 700,000 service personnel killed in World War 1. An even greater number were discharged because of wounds or illness. In September 1916, King George V authorized the Silver War Badge (SWB) to honour all military personnel who had served at home or overseas since 4 August 1914 and who had been discharged because of wounds or illness. The SWB was a small, circular badge made of sterling silver, bearing the king’s initials, a crown, and the inscriptions ‘For King and Empire’ and ‘Services Rendered’. The SWB was not simply an honour it also served a practical purpose. At the time, men of military age who were not obviously in the service were sometimes accosted or insulted by civilians presenting them with white feathers — a symbol of cowardice — for shirking their patriotic duty. The badge served as an outward symbol that the wearer’s duty to country had been honourably fulfilled. Ancestry.com. “UK, Silver War Badge Records, 1914-1920” Original data: War Office and Air Ministry: Service Medal and Award Rolls, First World War. Silver War Badge. RG WO 329, 2958–3255. The National Archives, Kew, Surrey, England.